Drishty Chittagong, in its sixteen years, has become a renowned organization in the field of socio-culture. It was born with a vision to enhance the extra-curricular activities amongst the students of schools, colleges as well as universities, who are still freshers in the arena of reality. To achieve so, Drishty Chittagong has been organizing recital sessions, impromptu competitions, cultural programmes, quiz championships, and mostly, debate workshops and contests. 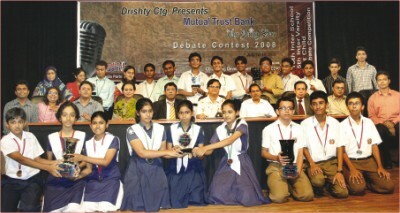 On the 10th of July 2008 began the highly anticipated Debate Contest at the Theatre Institute auditorium in Chittagong, with a call to build enlightened society through practice of logic. The inauguration ceremony was ornamented with the presence of the Chief Guest, The Daily Star Editor and Publisher Mahfuz Anam. He said students should practice debate as a means of acquiring the skill of thinking and making judgments in a logical way. The session was also graced by the speeches from the special guests Chittagong Development Association (CDA) Chairman Shah Muhammed Akhter Uddin, The Daily Prothom Alo Resident Editor of Chittagong Abul Momen, Mutual Trust Bank Senior Vice-President Mohammed Nazrul Islam and Drishty General Secretary Saif Chowdhury. The session was chaired by Drishty president Masud Bakul and moderated by Drishty Joint Secretary Adnan Mannan. Six debates were followed by the speaking session that day, commencing the inauguration of the 16th inter-school debate, 1st children's debate and 5th inter-varsity debate championship 2008. The Bengali inter-school debate championship is the most traditional event for Drishty Chittagong. It is now a craze in the metropolitan debaters to participate here. The debaters in children's category were all up to and no higher than sixth grade. This debate is the first of its kind in Chittagong, and has proven to be a very big success. Their refuting spirit made the audience applaud the loudest. The participants were: Sunny Tutorial, Silver Bells Girls' High School, Krishnochura School, Agrabad Girls' School, Ispahani Public School, Chittagong Government High School, Chittagong Collegiate School, Dr. Khastagir Government Girls' High School, Kapasgola City Corporation Girls' High School, Imaratunnesa City Corporation Girls' High School, St. Placid's High School. Having qualified in all the three qualifiers, Agrabad Girls' School made it to the final round with Ispahani Public School. The School-goers from grades seven to ten participated in the inter-school championship race. As well as the kids, they also made clear their hunger for the cup, and put up a clean battle of logic. The institutions to show such courage were: Silver Bells Girls' High School, Agrabad Girls' School, Chittagong Government High School, Chittagong Collegiate School, Dr. Khastagir Government Girls' High School, Kapasgola City Corporation Girls' High School, Imaratunnesa City Corporation Girls' High School, St. Placid's High School Chittagong Government Girls' High School, Nasirabad Boys' High School, Krishnokumari City Corporation Girls' High School, Chittagong Residential School & College, National Public School, B.N. School & College, Kadam Mobarak City Corporation Boys' High School, Kusum Kumari City Corporation Girls' High School, A.L. Khan High School and Chittagong Cantonment Public School & College. Following the tournament streaks, the finalists were Chittagong Collegiate School and Chittagong Government High School. The universities were as keen as these school-chaps to take the trophy home. The universities were: Chittagong University (Sabyasachi), Chittagong University (Anirban), Premier University, University of Science & Technology Chittagong (USTC), Chittagong University of Engineering & Technology (CUET) and Hazi Mohammed Mohsin College. In the tournament, Premier University and Chittagong University (Sabyasachi) knocked others out of their route to the finale. The final rounds of the contest and the prize giving session was held at the Theatre Institute auditorium Chittagong on the 19th of July, 2008. In the final round of the children's debate, Agrabad Girls' School spoke in favour of the topic 'merit cannot be judged properly through existing examination system,' and got defeated by their opposition Ispahani Public School. The best debater was adjudged to be the winning team leader Taohida Jahan Usra. An equally competitive battle of words took place in the inter-school debate final. The government team Chittagong Collegiate School in the parliamentary debate 'this house believes that, economic shortcoming is the main reason for our lagging behind' lost to their opposition Chittagong Government High School, and the best debater was named the winning team leader Mottakin Chowdhury. In the inter-varsity round, Chittagong University (Sabyasachi) opposed the motion 'this house believes that, it is possible to send poverty to the museum' against Premier University, and became the champion. The jury board elected the Chittagong University (Sabyasachi) team leader Jewel Chowdhury to be the best speaker. The prize giving ceremony was presided over by Drishty President Masud Bakul and moderated by General Secretary Saif Chowdhury. The Chief Guest Prof Dr. Moinul Islam, a famous economist, urged the students to prepare themselves as future leaders by acquiring vast knowledge so that they could lead the country in the right direction. Also present in the session as guests of honor were first Vice-President of BGMEA M.A. Salam, Mutual Trust Bank Executive Vice-President Md. Nurul Islam, Editor of Star Campus Shahnoor Wahid, Assistant Professor of Jahangirnagar University Asrar Chowdhury, Mutual Trust Bank Assistant Vice-President Ahsan Ullah Khan and Sunshine Grammar School Principal Safia Gazi Rahman. The event was made a success by the following persons who adjudicated the best debaters to achieve their glorious positions: Safia Gazi Rahman, Pradip Dewanji, Bipul Barua, Jinnah Chowdhury, Dr. Masud Rana, Dr. Abhishek Bhattacharya, Adnan Mannan, Mili Chowdhury, Sinha Ibne Humayun, Mabroor Wassey, Irfan Newaz Khan, Syed Rifat Farook, Shahidul Islam, Abdullah Md. Shukrana, Mobasshera Begum, Ishrat Jahan, Prasoon Kanti Dey and Kashshaful Haque Shehjad. The event was sponsored by Mutual Trust Bank and The Daily Star. The associate sponsor was Chittagong Development Association (CDA) and the radio partner was Radio Foorti.